Hello and happy hump day everyone. It's a beautiful Wednesday morning here in sunny Florida. A perfect day to share my Botanical Tea Wall Hanging inspired by a project I saw on Pinterest. Here's a peek at my project below, but make sure to go to Graphic 45's blog to see my original "Pinspiration" plus more close-ups photos and my YouTube video showing how it all came together. It was so much fun to make! And this is such a treat: I received a lovely e-mail from my internet friend Linda when she saw my You Tube video over the summer. 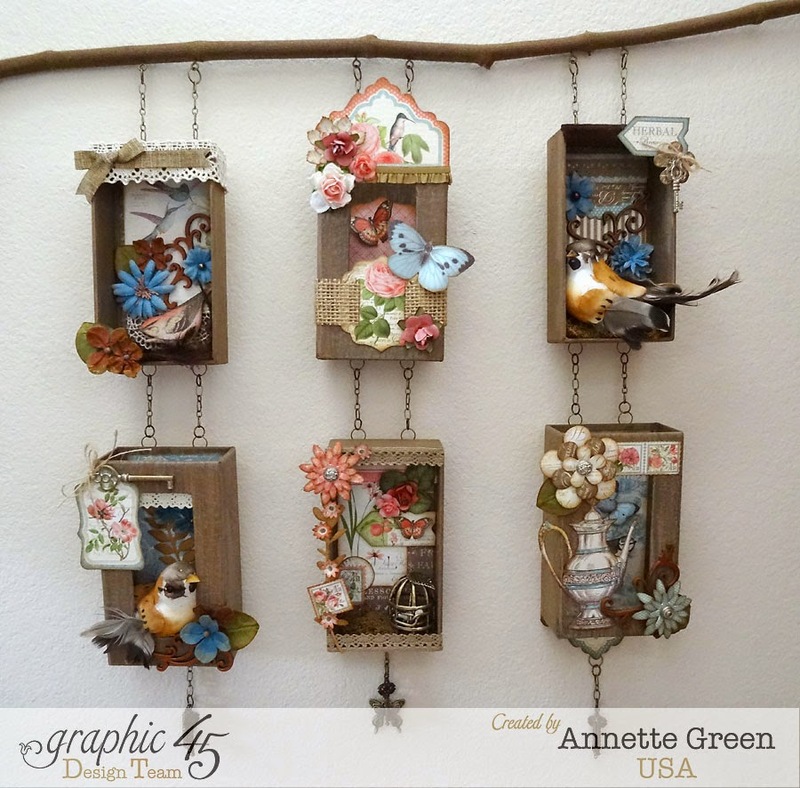 She was inspired by my project to create this lovely butterfly garden display of her own. It's true that Creativity is Contagious! I love all the organic texture and love that went into Linda's beautiful piece, don't you? Such a pretty wall hanging. Absolutely love this wonderful wall hanging project. I watched the whole video when I got the G45 email...I saw you used two different glues..was the white one tacky for the heavier chip pcs. and what was the clear you were using? Also, the 2nd piece of music, the one that always plays during happy scenes on Downton Abbey (my FAV show)...what is the name of the music? I Love that too...great pic of background music! Thanks Roxanne. Glad you enjoyed it. I used Alene's Super Thick Tacky Glue (white) and E6000 (clear). And you are sharp to recognize the Downton Abbey music. The second piece is called "Us and Them." You know how much I love your wall hanging :) but I have to say the second one is pretty darn cute also TFS! Very cute idea, enjoyed the video as well! !